What could be the Next Big Thing for your business probably already exists in one of your employee’s heads at this second. Think about that. Your next million or billion dollar business is just sitting there for you if you know how to look for it. People have great ideas for how to solve your customer pain, but most companies have no way to find, recognize, and cultivate great ideas. 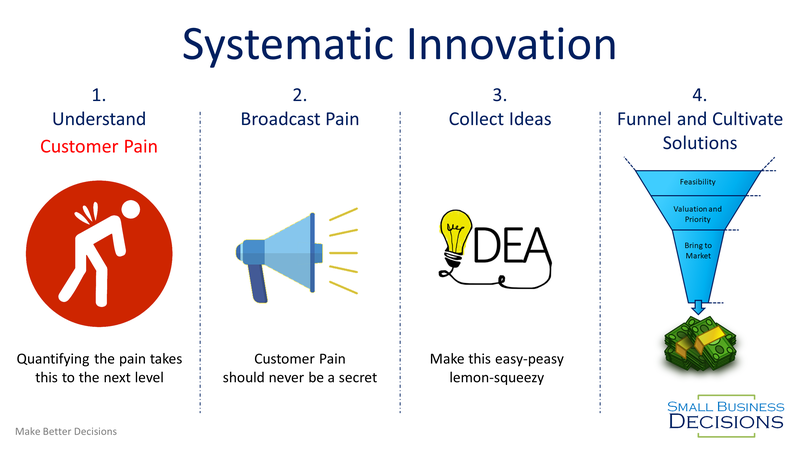 Systematic Innovation recognizes that real value starts with customer pain and builds a process to support solving that pain. Your customer has something that hurts, something that costs them, something that keeps them up at night. Find a way to help them express that pain, quantify it, and broadcast it to your entire company. You will most likely have more ideas for how to fix it than you can handle. Sometimes your customers are internal rather than external, so what? Use this approach for your department’s services, even if this isn’t a companywide thing. If we recognize that innovative solutions to customer pain exist, then we can develop a systematic innovation process. Figure 1 outlines the systematic process of Systematic Innovation. Start with Understanding Customer Pain, Broadcast that Pain and make it widely known, Collect Ideas without process friction, and funnel and cultivate those ideas into solutions that are ready to bring to market. There are many ways to do this. The simplest is to just ask. Ask your customers what keeps them up and night, what costs them the most money, and what keeps them up at night. In some cases, customers have lived with pain for so long that they think it is normal. Sometimes you can do what’s called “fishbowl” observation. Just go follow your customer around for a day like a kid looking at a shark in an aquarium. You’ll be amazed at how much you catch that they have come to think of as normal and “just the way it is”. There are entire books talking about how to re-define your customer base or to understand latent needs that you can use here to help understand and quantify customer pain. This is probably the lynchpin of making Systematic Innovation successful. The important part is making customer pain visible and real to as many people as possible. How you do this is up to you. I have, unfortunately, seen departments that keep quantification of customer pain a secret. That probably cost them more in the long run than it saved them. If you highlight customer pain as much as I’m suggesting, you will have more ideas than you can handle. The ideal system will make it easy to collect pain input on a web form that allows the submitter to rank their idea against a specific pain point. If you make this step hard to find and more work than a few minutes, your busy employees won’t take the time. It is also a good idea to offer some sort of reward or recognition as a thank you for successful ideas being submitted. This step takes a special someone to lead. Someone who isn’t afraid to challenge the status quo. Someone who strives for the next big thing. This person and their team will follow a funneling process to cultivate all of the ideas that come in. It will start with feasibility, then valuation and prioritization compared to customer pain, and finally getting the idea to a point where it can be brought to market. Sometimes ideas will be before their time. If that is the case, then make sure you have a parking lot for good ideas that didn’t quite make the cut which you review periodically. Best-in-class companies will know how valuable their customer pain points are. If you are not there yet, you can list customer pain in order of importance. If you know the actual cost to your customer of each item, then employees can self-sort whether ideas are close enough to solving a problem profitably. Employees will tend to spend more time thinking about the customer pain that is the biggest. Once you have quantified customer pain, the valuation and priority step in the funnel is much easier and more accurate. Quantification of Customer Pain is one of the first steps in Value-Based Pricing. Starting with Systematic Innovation and ending with Value-Based Pricing is one of the best ways to profitability through product or service differentiation.